So, when you’re moving twice within the span of six months, cooking becomes difficult. Especially when you are living with your husband’s parents and they have particular tastes. Most of which involve Waffle House. Their hospitality was an incredibly generous and patient gesture on their part, but it certainly does feel good to get back in the kitchen. Yes. That’s a good way of putting it. Also, maybe it is because of my Jewish background or something, but I an incapable of screwing up latkes. Believe me, I tried multiple times, bubbalah, and I just couldn’t mess them up. It’s in my blood! This recipe marks my first attempt at making latkes, and they were a hit. Very easy to do, so just follow the recipe and you got it! 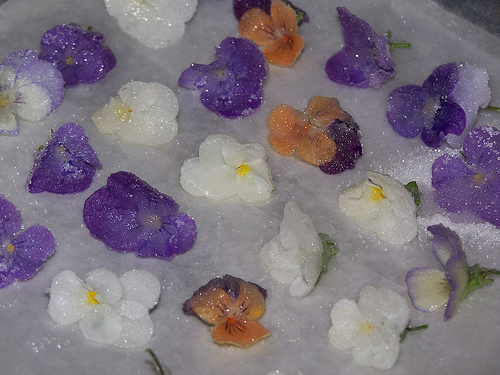 This will also be the first time I have worked with edible flowers in a recipe. The ones I nabbed at Harry’s Farmer’s Market definitely had an interesting taste. Sort of like a cross between mint and parsley. Perhaps in the future, flowers could be a fun medium to work with again, though I think I will refrain from the bulbs and stick to the petals. Like this! So, what exactly am I getting at? What does this have to do with Batman? Why am I talking to myself? I based three components of the meal on three of the main villains in the game: Killer Croc, Scarecrow, and Poison Ivy. The dessert is based off the head honcho himself, Mr. J., a.k.a The Joker. For Killer Croc, I totally wanted to go with crocodile meat, but as I am still broke, and this specialty meat can be hard to find, I went with sea scallops instead for a “faux” croc meat. 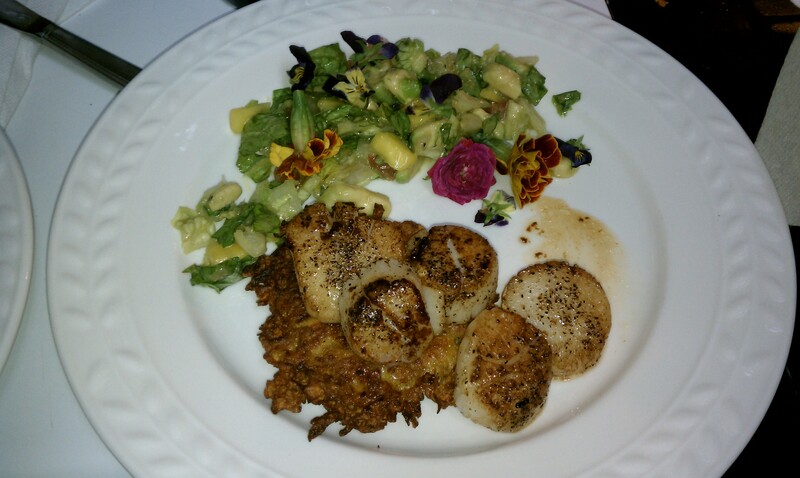 The scallops top a “straw” sweet potato latke, and on the side there is a serving of salad made from edible flowers, mango, tomato, and avocado, topped with a honey dijon vinaigrette. Dessert, well, that’s a surprise,. You will want to chop your avocado, tomato, and mango up, and then toss with the romaine and dressing. Serve with the edible flowers sprinkled on top. 3/4 cup of vegetable oil, or frying oil of your choice. Shred the potatoes, and mix in the shallots, salt, and pepper. Next, stir in the beaten egg and flour until all the ingredients adhere together. Begin heating your 3/4 cup oil in a pan at medium-high heat. You may need a splatter guard. Scoop out batter by 1/4 cup fulls, and drop the potato balls into the oil. Flatten with a spatula and let cook on each side for about 1 1/2 minutes. Do not exceed 2 minutes if you decide the latkes need more time. Transfer finished latkes to a plate with paper towels to sop up some of the oil. 1 Tbl. oil or butter. You can even reserve some of the oil from your latkes for this part! Give the sea scallops a good coating of sat and pepper on the top and bottom. Start placing your scallops in the pan. You will want to give the scallops about 3 minutes and some change a side. You are looking for white sides that will oppose their original, pre-cooked translucence. A minor split in your scallops is not the end of the world, but if you have multiple splits across the tops or bottoms, that usually indicates over-cooking. I cheated a bit, but it was still delicious. 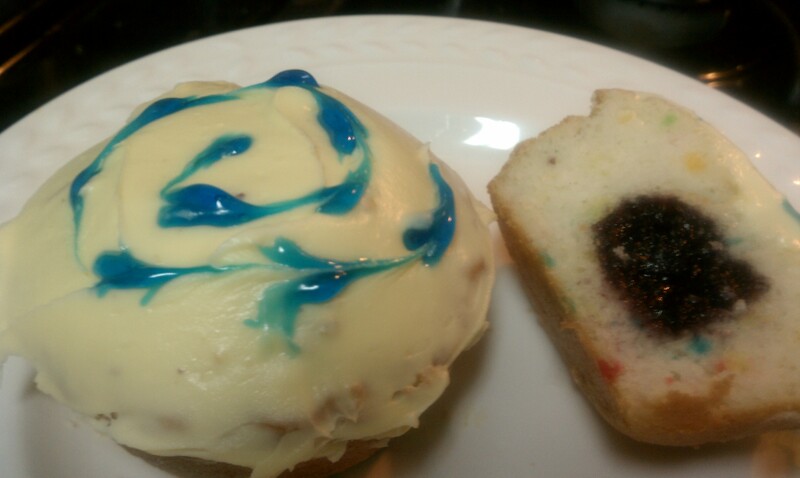 For my Joker Cupcakes, I picked out my favorite jar of preserves, and my favorite kind of cupcake. I usually dig on chocolate, but I couldn’t resist picking up the confetting cupcake batter to commemorate the awesome surprises the Joker left throughout Arkham Asylum. So, about 6 minutes into your cupcakes cooking, open the oven, and pull out the tray. Start to top the cupcakes with a spoonful of your favorite preserve or jam. Push the cupcakes back into the oven, and finish their cook time. Once they come out of the oven, let them rest, and then set the cupcakes on a cooling rack. When the cupcakes have had some time to cool, you can start smearing them with your favorite icing and decorations. And that’s it! Great to be back in the saddle again.